Fear is a big problem for many of us, even those washed in the precious, saving blood of Christ. He really wants us to get this. We are not to fear anyone or anything but HIM! He admonishes us not to conform to the world around us even in what they fear. Fear is actually an issue of faith. If we have given Him our lives and still fear, we are walking in the sin of unbelief because we do not believe the promises He has given us. If we believe what God has told us in His word, truly believe it fully and not just intellectually, then we need not fear. It is a dangerous thing to only believe intellectually. When the rubber meets the road we find out what we TRULY believe. Do we fear or do we live in His peace? I for one am striving to mature in Him to that place. Let's not be satisfied to live far below the blessings He has given us, but let's live true lives of faith and so not become enslaved again to fear as those in the world, and let's live in His peace that passes all understanding! What a gift! Your link did not work for me .. . but I am totally impressed with the lichen. Which one of the photoshop tools do you use to cut it out??? ooo I love this lichen! Oh mang! the link didn't work! I'll check back later... TY! 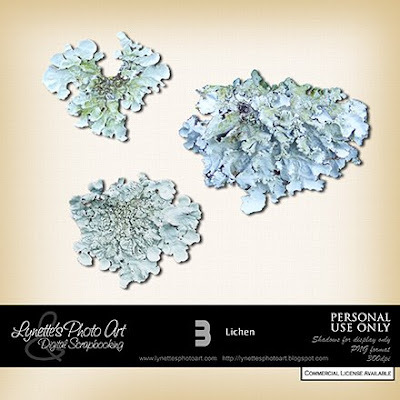 Hi Lynette, just letting you know that there is a message - file link not valid - when you try to download this lichen.